Arrrr, avast ye scabrous scallywags! With the recent release of the Tales of Monkey Island game, and the upcoming release (as of the time of this writing) Secret of Monkey Island Special Edition, I was in a very pirate-y mood this weekend. So I decided to play the only (dyarrrr, that takes the wind out o’ me sails) co-op pirate game out there, Certain Affinity’s Age of Booty. With a few fellow lubbers in tow, we set sail in the hopes to pillage some villages, sink a few ships, and fill our holds with pieces of eight. 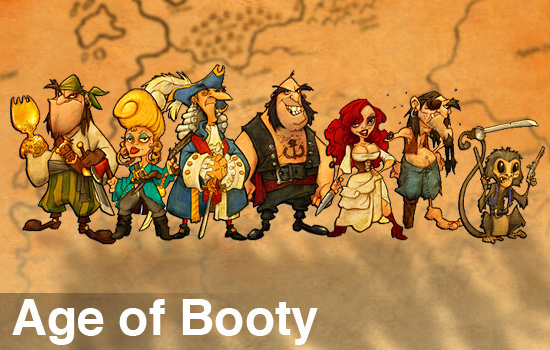 Age of Booty is a real-time strategy game that puts you in control of a pirate ship that’s out to capture a few towns before your rivals. You only control the one ship, which can be upgraded through the collection of resources that are generated by the town. 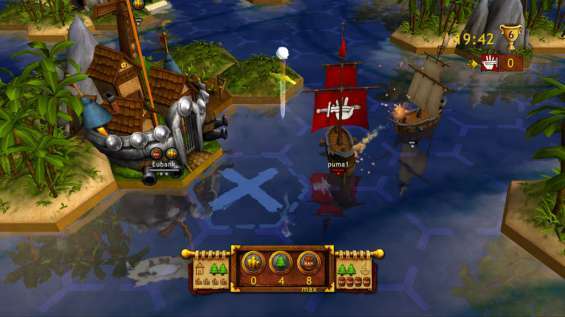 In the single player mode, you and a group of AI partners race against the other pirates to capture the most towns first. In co-op mode, the goal is the same, but you now have real live partners to help out, which is a much preferable option. Since none of us were exactly up for searching for another group of players to take down, we went with the tried and true comp stomp. My friends and I formed the Red Hand team (and a more foul-tempered, grog-swilling, bloodthirsty gang o’ Jacks you will not meet), while our AI adversaries, the fearsome Admiral Enis and his band of Trained Monkeys, formed the Poison Talons. With the teams set for a 4v4 match, all that was left was for us to get to pillaging! YARRR! After drowning our sorrows in some grog, we pulled ourselves together and prepared to show those monkeys no quarter. This time, we decided to take a slightly more tactical approach. We broke up into teams of two to tag team the capture of towns. We successfully managed to capture two (of the four) towns that we set out for, and the Admiral and his monkeys had only one captured. However, this brought about the second challenge for our team; specifically, defending our towns against attack, while ensuring that the Poison Talons didn’t capture more. This time we used the town’s defenses to our advantage as just one of us could stay behind and guard the town while the others were free to continue rampaging and pillaging. Before long, we had wiped the Admiral’s decks with his own monkeys and had brought the win/lose count to one and one. With a better idea of how the game works, and how to co-op our a way to victory, the bloodthirsty Red Hands went on to several more victories before calling it a day. While maybe not allowing me to truly swash some buckles or swing from the masts to raid an enemy vessel, Age of Booty certainly provided something new and different. Underneath a rather simple exterior of sailing around capturing towns before your opponent does, the game has quite a bit of depth and strategy to it. After playing a few single player missions with the AI partner, I definitely started missing my co-op buddies. The Trained Monkeys had more intelligence and a better ability to commandeer a ship than the AI partners with which I was stuck. As there’s not really any story to speak of with the missions, this game is definitely one where ye should be stickin’ to co-op play when ye weigh anchor. Page created in 1.0136 seconds.